An interview with Sacra Liturgia’s international coordinator, Dom Alcuin Reid, about the recent London conference and the reactions to Robert Cardinal Sarah’s Address. Sacra Liturgia (sacraliturgia.org) held its third international conference in London, England, from July 5-8. Its keynote speaker was Cardinal Robert Sarah, Prefect of the Congregation for Divine Worship and the Discipline of the Sacraments. His Address, “Towards an Authentic Implementation of Sacrosanctum Concilium”, has given rise to widespread comment and debate. CWR corresponded with Sacra Liturgia’s international coordinator, Dom Alcuin Reid, about the London conference and the reactions to Cardinal Sarah’s Address. CWR: Dom Alcuin, how did this third international Sacra Liturgia conference go? Dom Alcuin Reid: Very well, thank you. Thanks to the efforts of the UK organizers and the support of benefactors we were able to bring together an excellent group of speakers who were highly appreciated by the more than 200 participants who came from nearly twenty different countries. And, as is our custom, we were able to celebrate beautiful liturgies in the modern and older uses of the Roman rite as well at the London Oratory and, this time, also in the use of the Ordinariates for Anglicans who have entered into full communion with the Catholic Church. In addition we enjoyed a sublime concert of sacred music thanks to Charles Cole and the Oratory School Schola. They were four days of profound intellectual stimulation and of prayer. Of course Cardinal Sarah’s keynote address was the highlight. His personal appeal to priests to adopt the practice of celebrating the Liturgy of the Eucharist ad orientem (facing East) from the first Sunday of Advent was a profoundly moving moment—perhaps indeed an historic one—at the beginning of the conference. 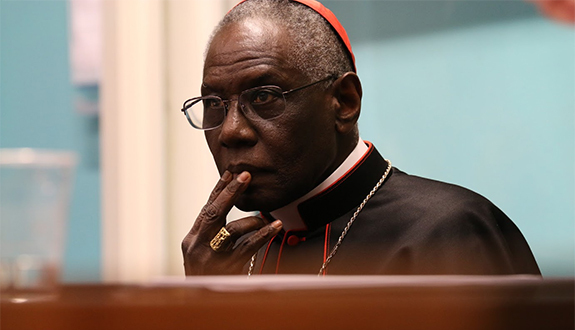 CWR: Why did Cardinal Sarah choose to focus on the issue of orientation? Dom Alcuin Reid: The Cardinal has emphasized the importance of facing East before – in the Vatican newspaper (June 12, 2005) and in the French journal Famille Chrétienne this past May. So it could be expected that he would speak on this again. Perhaps, though, his appeal to priests to adopt this beautiful practice “with prudence and with the necessary catechesis, certainly, but also with a pastor’s confidence that this is something good for the Church, something good for our people” from the first Sunday of Advent this year added an immediacy that his previous mentions of this did not have. I imagine that he wanted not just to talk about this, but to encourage priests to begin the necessary work of formation so as to implement it. But the Cardinal’s address touched on many, many other important topics also. One was his revelation that the Holy Father, Pope Francis, had asked him to begin to study possibilities for mutual enrichment between the older and newer rites – what some people call the question of “the reform of the reform.” It was certainly heartening to learn that the Holy Father is open to considering this, and indeed that Cardinal Sarah will be commencing this work. There are many, many other important things contained in the Cardinal’s Address. We should not forget that, as its title indicates, he was exploring ways in which we can be more faithful to the Second Vatican Council’s desires for the Sacred Liturgy. People should carefully read the full and official text which was published on Monday in English and French at his direction. It is a mine of profound insights and practical reflections on how to implement the Council more faithfully today. CWR: What was the response like to the Address at the conference? CWR: Have you been surprised by the response outside the conference and by the Vatican’s “clarification”? Dom Alcuin Reid: It has to be said that some responses on internet sites and even in prominent journals have been astonishing. To accuse Cardinal Sarah of lying in respect of what Pope Francis has said to him about continuing the work of the Pope Emeritus or about studying a possible reform of the reform, or to say that the Holy Father ‘slapped down’ the Cardinal, is patently absurd and utterly untrue. No one who has the privilege of knowing the man, or indeed who has read his recent book God or Nothing, could believe him to be a liar. A more humble and honest priest and bishop one could not wish to find! And there is no evidence from the Vatican’s statement, or elsewhere, that the Holy Father was either angry with him or rebuked him. It is quite normal to clarify false reports: that is what has been done – though the clarification itself could perhaps do with some clarification! Cardinal Sarah remains in post and his Address has not been withdrawn. Indeed, it should be noted that he asked us to publish it after his meeting with the Holy Father, and he has withdrawn nothing of what he said in London. It is clear, though, that his Address has touched a very raw nerve amongst those who have turned certain modern liturgical practices– such as celebrating Mass facing the people – or indeed the whole of the modern liturgy, into an idol. And it is well known that Curial officials have abhorred any use of the term “reform of the reform” for many years lest their idol be in some way impugned. Cardinal Sarah has dared to challenge such prejudices and, seemingly, those who murmur in the shadows have been busy whipping up a storm so as to distract from what the Cardinal in fact said. They have not responded to his arguments or his proposals with counter arguments. Rather, they have set up straw men and screamed hysterically at the sight of the creations of their own minds. Once again I would say, and emphatically: read the Cardinal’s full text. Engage with what it says. Ponder the fact that this is not a point-scoring salve in the so-called liturgy-wars, but the profound personal reflections of a priest, bishop and cardinal who was called – apparently against his will – by Pope Francis to serve as Prefect of the Congregation for Divine Worship and Discipline of the Sacraments. There may well be other approaches, but those he propose at least deserve a respectful and serious hearing. CWR: What were some of the other talks about? Dom Alcuin Reid: Your readers can find all the speakers’ details and topics on the Sacra Liturgia UK website. Abstracts and extracts from all the talks are posted on the Sacra Liturgia Facebook page. I would highlight two presentations in particular. Father Michael Cullinan’s paper “The Ethical Character of the Mysteries: Observations from a Moral Theologian” which underlined the fact that what we experience at Mass has a direct importance for our moral lives, calling us back to a greater liturgical fidelity (and to related practices such as fasting) so that we might be more able to live the Christian moral life. Notre Dame’s Professor David Fagerberg also underlined the liturgy’s importance for Christian social action in the world insisting that if we are liturgically-formed we shall necessarily have an inherent concern for the created world. He reminded participants that liturgy should overflow the sanctuary so as to both comfort the poor and to honor creation. CWR: Speaking of Sacrosanctum Concilium, can you provide some key points from your address on the Debate of the Schema on the Sacred Liturgy at the Council? Dom Alcuin Reid: Again, these are available on our Facebook page, but briefly, I examined what the Council Fathers said and did at the Council when considering the reform of the Order of Mass that is asked for in article 50 of the Constitution. It may come as a surprise that on the Council floor itself, before approving this article, the Fathers were reassured both verbally and in writing that “The current Ordo Missæ, which has grown up in the course of the centuries, certainly is to be retained.” I argue that there is no evidence that the Fathers were approving radical changes to the liturgy, but simply moderate reforms: an evolution, not a revolution. All of the papers will be published in a book as soon as possible, as have the papers presented in Rome in 2013 and in New York in 2015. CWR: What is next for Sacra Liturgia? Dom Alcuin Reid: Our annual Summer School takes place in the South of France next month (August 5-17). And then, as was announced at the end of the London Conference, with the blessing of His Eminence, Cardinal Scola, we will meet again in Milan, Italy, from June 6-9, 2017 for a full academic conference with the translation of all presentations into both Italian and English. More details will be released on our sites after the summer.